The globalization of terrorism over the last decade has created a situation in which the number one threat to international security is no longer strong, conquering states, but failing ones that provide safe havens for terrorist organizations. Drug trafficking in Africa reflects the heart of this concern. The illicit trade is both contributing to the deterioration of state institutions – which could result in state collapse – and financing terrorist groups like AQIM and Al-Shabaab. So far the international community has not treated the matter with the urgency it deserves. The consequences of inaction will be dire, as has already been seen in Central America. The region’s misfortune of being an important transit route between South American cocaine production centers and North American consumers has resulted in the highest murder rates in the world, fueled by transnational organized crime and drug trafficking. The statistics are astonishing: Among 20-year old men in some Central American countries, 1 in 50 will be murdered before they are 32. Africa, a region already replete with weak states, might be next if drug trafficking on the continent continues to grow. UPDATE: The coup leaders have set up a transitional government and dissolved all state institutions. Soldiers have taken control of much of the capital of the Guinea-Bissau in what appears to be a coup attempt. Heavy gunfire was been heard in the city of Bissau and the residence of outgoing President Carlos Gomes was reportedly attacked. Troops have also taken control of the national radio station and the ruling party’s headquarters. I have a strong feeling that this latest coup attempt (just like the murder of President Vieira and Gen. Waie and last December’s coup attempt) is related to the drug trade. Since mid last year the country has witnessed multiple coup attempts, despite a brief flirtation with democratic rule under the late President Sanha. Guinea-Bissau is among West Africa’s budding narco states which have, in the last decade or so, become a major transit point of drugs from Latin America destined for European markets. Bacai Sanha, President of Guinea-Bissau has died in a Paris hospital. 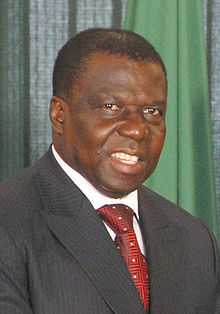 Mr. Sanha was elected president in July 2009 following the assassination of former president Joao Bernardo Vieira by elements in the military. Guinea Bissau has in the recent past experienced drug-trafficking-related political instability. Mr. Vieira’s murder was linked to a dispute between him and his military chief over drug connections. Last month’s arrest of the head of the navy on suspicion of plotting a coup was also drug related. It remains unclear whether Mr. Sanha’s succession will follow constitutional channels or whether the military will take over. President Alpha Conde, Guinea’s first elected president since independence, appears to have survived a coup attempt in the early hours of Tuesday. Mr. Conde’s residence was hit by rocket fire in what appears to have been a coup attempt. I believe that local horse-trading should always be given a chance before the internationals fly in to impose agreements on feuding factions. But when local factions have fought each other to a stalemate – as is the case in Chad, Central African Republic, Guinea, Guinea-Bissau and Somalia – it might be time for the international community to provide a helping hand. Millions of civilians should not be left to suffer simply because a few men cannot strike a stable deal. The interventions will be nuanced and complicated and messy – so I can’t spell out the terms here – but simply sitting back and watching is not an option. Simply stated, the men with guns in Guinea are irresponsible. Guinea is also a budding narco-state. I would not be surprised if the latest attack on the president is linked to the emerging drug problem in west Africa. It is common knowledge that the son of the immediate former president of Guinea, Ousmane Conte, has/had ties with the drug trade. President Joao Vieira of Guinea-Bissau and the country’s top military officer were killed in 2009 in what was rumored to be a drug-related feud. Mr. Conde was elected in a run off with 52% of the vote. Two years earlier in 2008 the army carried out a coup following the death of the country’s second president, the late Lansana Conte. Mr. Conte himself came to power in a coup following the death of Guinea’s firebrand founding president Sekou Toure. Many hailed the generals’ decision to return to the barracks in 2010 as a new turn in Guinean politics. They were wrong. The BBC reports that a former army chief, Nouhou Thiam, has been arrested in relation to the Tuesday morning attack. The Kenyan Prime Minister just admitted to the presence of drug money in Kenyan politics. Huge. Also, check the UNODC’s drug trafficking patterns for East Africa. Also, does anyone out there have a copy of the report on drug trafficking in Kenya? Care to share? I have written before about the growing problem of drug-trafficking that is creating new problems for already fragile African states. Of note is the fact that the problem is not just limited to the usual suspects – weak or failing states – but also extends to countries that most would consider to have it together, like Ghana, South Africa and Kenya. The most alarming thing about this new trend is that in most of these African countries drug-trafficking happens with the consent of those in government. For instance, in Guinea the son of former president Conte was for a long time a leading drug kingpin. In Guinea-Bissau President Vieira’s and Gen. Na Waie’s deaths in March of last year were a result of drug-related feuds. In Ghana President Atta Mills has lamented that the drug lords are too powerful to rein in. In Kenya, a woman (rumored to be) close to the president and other elites have been linked to the drug trade. Indeed on June 1st President Obama listed a sitting Kenyan Member of Parliament (Harun Mwau) as a global drug kingpin. In South Africa former Chief of Police, Jackie Selebi, was jailed for 10 years in 2010 on drug charges. More recently the wife of the South African Intelligence Minister (Sheryl Cwele) was found guilty of having connections to the illicit trade. In 2009 a Boeing 727 crashed and was later set ablaze by suspected drug traffickers in Mali. The plane is believed to have been a drug cargo plane from Latin America destined for Europe. Other African states whose drug connections have also come to light include The Gambia (where rumors abound that President Jammeh is himself involved in the trade in drugs and arms in collusion with the Bissauian army) and Mozambique (H/T kmmonroe). You can find related news stories here and here. Clearly, this is a real problem that if not nipped in the bud has the potential of growing to Mexican proportions, especially considering the already low levels of state capacity in most of Africa. In just a few years, West Africa has become a major transit and re-packaging hub for cocaine following a strategic shift of Latin American drug syndicates toward the European market. Profiting from weak governance, endemic poverty, instability and ill-equipped police and judicial institutions, and bolstered by the enormous value of the drug trade, criminal networks have infiltrated governments, state institutions and the military. Corruption and money laundering, driven by the drug trade, pervert local politics and skew local economies. law enforcement and judicial approaches with social, development and conflict prevention policies – and they should involve governments and civil society alike. Remember the story about the mysterious cache of arms found in Lagos Port, Nigeria? Well, turns out the story goes beyond Nigeria. FP reports that there is reason to believe that the arms from Iran were destined for The Gambia. Authorities in Banjul expelled the Iranian officials in the country, increasing speculation that the arms were meant for rebel groups linked to last year’s coup attempt against President Yahya Jammeh who by the way, cures AIDS on Thursdays. Just as Libya is retreating from its bad habit of financing and arming rebellions all over the Continent Tehran appears poised to assume this role, especially in Muslim sub-Saharan Africa. There is not a clear strategic reason for this kind of involvement by Iran in The Gambia, although theories abound out there. To add to these, I think it might be that someone within the Iranian government is involved in the global drugs trade and wanted to use The Gambia as a transit to Europe. On November 19th Nigeria discovered US$ 10 million worth of heroine shipped from Iran. West Africa plays a major role in the global drugs trade. Barely afloat West Africa states, particularly Guinea and Guinea-Bissau, are key transit points for drug shipments from Latin America and Asia into Europe. The BBC reports that a coup is underway in Guinea-Bissau. You may recall that Guinea-Bissau had a coup last year after the president fell out with the head of the military. After killing their president earlier this year, the military strongmen in Guinea Bissau seem bent on eliminating his surviving allies. The BBC reports that the tiny West African nation’s army killed a number of suspected coup plotters, including Baciro Dabo, a minister and former close ally of the late president Vieira. Mr. Dabo had expressed interest in running for president in elections that are due later this month. The elections will now more than likely not take place. The latest episode of violence just illustrates how much out of touch the army is with reality. The impoverished West African nation of 1.5 million has seen slow recovery from a disastrous civil war in the late 1990s. With a per capita GDP of $ 213 ($ 600, PPP) it still has a long way to go. It is heavily dependent on farming and fishing, with cashews being the major crop. Political instability and insecurity are only going to make matters worse. And perhaps the saddest part of all this is that no one beyond the Guinean borders cares. ECOWAS will not help, the UN has its gaze fixed on the many conflicts in Central Africa and the AU, under the leadership of Muamar Gaddafi, would rather not be bothered – beyond issuing statements.